Last year, I’ve been to Javazone and among the many great speakers was Kevlin Henney. His talk was titled Cool Code and if you havn’t seen it, I can highly recommend it! (same goes for all talks by Kevlin). One of the things he mentioned in his talk were word clouds generated from code to get a good overview of what a programm is about. They provide no hard facts but a very intersting insight nonetheless. 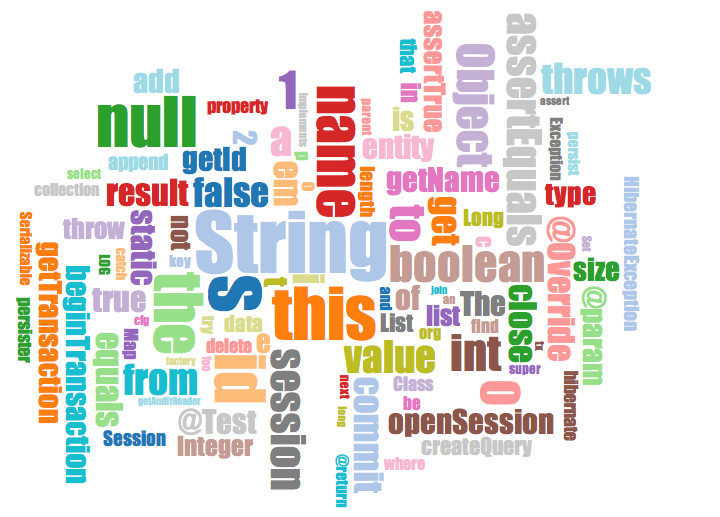 The following is a word cloud generated from hibernate-core with the 100 most common words in the codebase. The bigger the word, the more common it is. On the first glance, one can see, that hibernate deals with lots of Strings and takes a great deal of work to somehow handle null. Names and sessions are important to hiberante as well and obviously, hiberante also deals with transactions. I really like this kind of visualization of code. It provides no hard facts but it can help detect code smells and project priorities. If String is very common, this might be a sign of an insufficient domain model. Maybe a few more classes should be introduced. Same goes for Object. In general, a code cloud should talk about the domain of the programm. About customers, orders and the like. It should not talk about implementation details like Strings or booleans. (Since hibernate-core is a general library, it might be ok, that transactions and sessions are not the primary words but Strings and Objects - although I somehow doubt it). Use code clouds as an additional datapoint, don’t rely to heavily on them and they might turn out to be a useful little tool in your analysis box. After Javazone, I tried to create code clouds for the projects, I was working on. However I couldn’t find a good tool. Wordle generates nice clouds, but it works only online. I am not so comfortable with uploading my complete codebase of customer projects to some website. So Wordle was out of the game. Apparently there were a few Windows tools, but I didn’t check them out. But the idea of code clouds stuck with me. So I started playing around with it a bit and created cloudserver. The above cloud of hibernate-core was created with it. So cloudserver got a bit of a playground of technologies. It is mostly written in CoffeeScript. It reads in source files, cleans them up a bit and counts each word. After it is done processing all files, it brings them in a d3-cloud-friendly format and starts a local node.js webserver. This server serves a small html file that contains the d3 bootstrap code and generates the cloud. I tried to keep it mostly language agnostic with a pluggable system to configure it to specific languages. Currenlty it only supports Java, but it should be fairly easy to make langauge configurations for other languages. I have lots of ideas on how to improve cloudserver, like stripping comments. And it is surely not bugfree. Since this is my first contact with node.js and I am still not very mature in CoffeeScript, I assume there are lots of rookie-mistakes lurking around. I plan to write up my impressions of node.js and CoffeeScript in seperate posts. If you used cloudserver, have questions or ideas, I would love to hear from you! I would also love to show you some more clouds, but I currently only have customer-projects with interesting code bases around - and I am not comfortable with presenting them here.